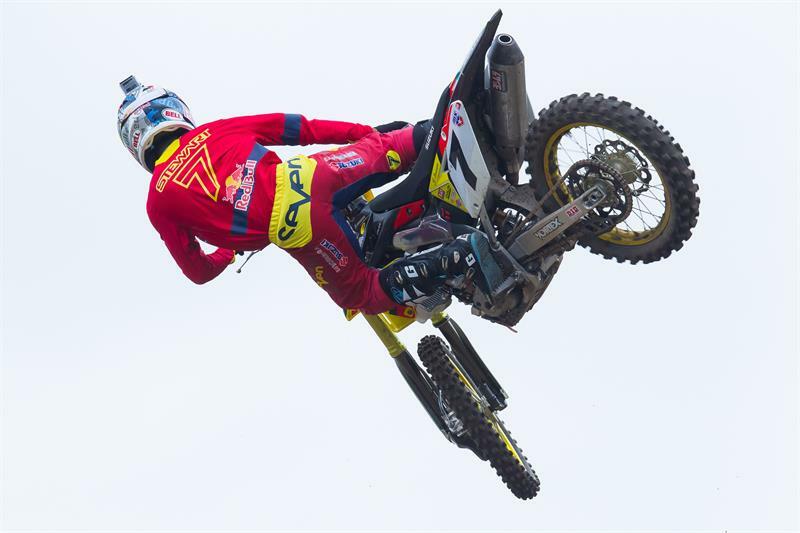 Team Suzuki Press Office – June 10. Yoshimura Suzuki Factory Racing’s James Stewart brought home his first overall podium finish of the season at the third-round Thunder Valley AMA Pro Motocross Championship event at Lakewood, Colorado on Saturday. Stewart turned in two solid motos on his Yoshimura Suzuki RM-Z450, taking the win in moto one and finishing third in moto two for second-place overall; moving him up to third in the championship points standings. In the first moto, Stewart got a spectacular start and moved into the lead almost immediately. From there, the Yoshimura Suzuki rider put his head down and held off the competition, leading every lap to the flag. In the second moto, Stewart got off the gate in the top-five and began trying to reel in the frontrunners. Despite a brief off-track excursion, his efforts began coming to fruition with about 10 minutes to go. Stewart was able to move into a podium position and hold on to finish third. With the combined results, Stewart was second for the day. Yoshimura Suzuki Factory Racing’s next race is round four of the 2014 AMA Pro Motocross Championships on June 14th at the High Point National in Mt. Morris.